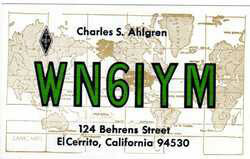 Ahhhhhhhhhhh the memories.....I was licensed as WN6IYM back in April, 1971...Don, WA6FFF (sk) was my Elmer. Although he had no offspring of his own, over the years he had helped a lot of you guys get their tickets. Don had his own shack built on the back of his garage, and ran a pair of Drake twins to a homebrew cubical quad at about 40 feet. I had the pleasure of my first exposure to ham radio and chatting with someone on that rig. I was a really nice set up for its day. I had been a short wave listener ever since I saw a neighborhood friend's SWL rig...I built a Heathkit GR-64 receiver and then decided to get my ticket...I learned code from a 33-1/3 rpm record from Radio Shack that I played on my sister's stereo...Once I got the ticket (code test administered via an old paper tape machine -- WWII vintage), I got on the air with a DX-60B that I built (my parents were always big on building things and learning from the experience)..Then I built the companion receiver (HR-10B) for the ham bands (they cost about $80 each at the time, I believe). Then came the General Class upgrade (trip to San Francisco Customshouse and all)...I added the HG-10B VFO. The antenna was a Hustler 4BTV on the ground with a 75-meter resonator and a Dipole for 80 meters. I got a summer job after the first year of college and upgraded the receiver to a Drake 2C (I still have it)....Also built a Heath Q-multiplier, crystal calibrator, SWR/Wattmeter, electronic keyer, HW-7 QRP rig, tube checker, VTVM, and VHF police band radio...Great fun and a great way to learn about electronics.. While I was a novice, I worked most of WAS (had a couple of rare ones like WY and DE to catch as a General, I believe)...Used crystals on 40 meters and had one or 2 that would multiply up to 15 meter Novice band...In those days you had to be clever to work stations as you could not move around as easily as you do now. 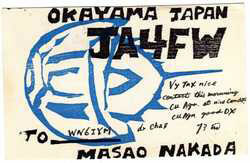 Sad to say, but I have only one DX QSL card from my Novice days. It is shown at left. In high school I belonged to the "I Tappa Key Radio Society" at El Cerrito High School, call sign WA6GDR; or Willie Alpha Six, blank , blank Republican...We had a National NC-300 receiver and a Johnson Viking Valiant transmitter that had an old Astatic D-104 microphone...We also had a Navy surplus regenerative receiver that no one knew how to operate...We loaded up end-fed long wires that sloped upward at a steep angle from the electronics shack to the top of the main building - probably at least 150 feet or more. We fed the wire directly from a short piece of coax via an insulator that ran through the wall. Counterpoise you ask? There was none that I remember, but there could have been an existing ground system I knew nothing about or was not aware of. At any rate, looking back on it all, the SWR was probably pretty high (no meter), but I seem to remember the Valiant loading up just fine! The Club had a pretty decent membership roster in the late 1950's and throughout the 1960's under a teacher that retired before I got there, but there were only about 3 hams at the school during my tenure. So, that rig did not see much activity during my days and during my Senior year, I was the only licensed ham at the school. In fact, I do not even know where the rig came from, but my guess is that the retired teacher donated it to the club. The modulation transformer smoked and someone had rewired an outboard affair that took its place (sitting on top of the cabinet in its own aluminum housing). I worked a lot in the electronics lab helping to build and repair the school's fleet of Heathkit electronic test equipment, and of course took electronics classes. With all the students in those classes, we somehow could not get anyone interested in obtaining a ticket. I think learning the code had a lot to do with it; you needed to be self-disciplined to be able to successfully study for the exams in those days. To my knowledge there was no local radio clubs that offered classes. Upward and onward after graduation. I spent the summer getting my General ticket (had to take the test more than once, and wait six weeks in between sittings!!). I became WB6IYM in September, 1972, just in time for college. I became a member of the Contra Costa Community College Amateur Radio Club. The club ran Drake TR-3 transceiver and an old National NCL-2000 linear amplifier (you could arc the caps if you had it on SSB and keyed the TR3 in CW mode!!). The antenna was a Mosley TA-33 about 30 feet above the flat steel roof; had dipoles for 40 and 80. I spent my first 3 years of college operating that station and having a lot of fun before transferring to UC Berkeley and pursuing a degree in Structural Engineering. The sun spots did not cooperate in the early 1970's so we did not work a lot of DX, but we sure had fun rag chewing on the bands. It was during this time that I bought my Drake 2-C receiver and my Yaesu FLdx-400 Transmitter. I remember many summer evenings rag chewing on the 40 meter band with that rig (zero beating the transmitter to the receiver). Anyway, I am getting a bit off topic here. The 1970's was a great time to be active in ham radio. And it is too bad that our hobby seems to be dying out. I suppose that the generation that came of age in the 1950's, 60's and 70's did have a great time with a lot simpler apparatus than we have now, but what a challenge to work the world with such minimal equipment. I have often thought about building one of the kits on the market, just to bring back memories of doing something like that. It is truly rewarding.